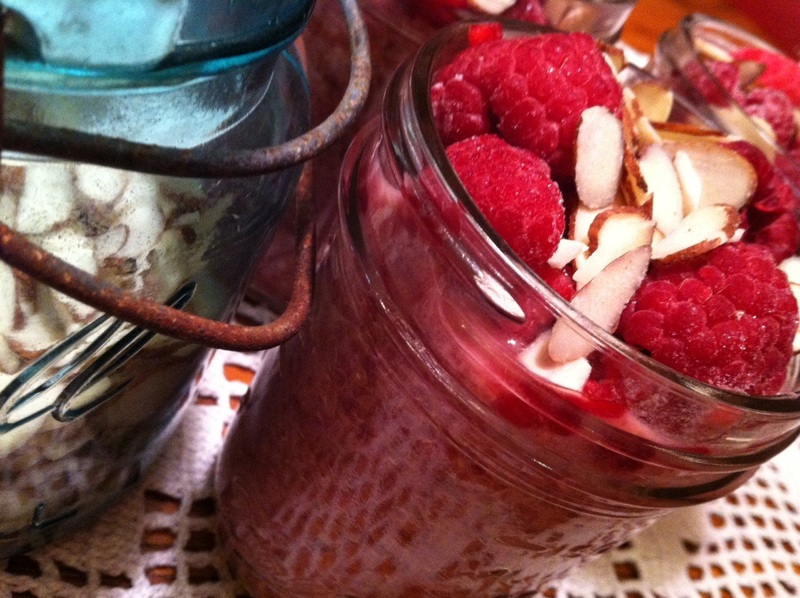 Raspberry Almond Breakfast Quinoa – Filling, GF, Vegan – and 4 days worth of breakfast! Let’s face it. If you are a working stiff Monday – Friday, you can be hard pressed to eat a breakfast that is healthy, filling, and easily prepared the night before. Skipping breakfast is not an option for me, and it shouldn’t be for anyone else either. Breakfast is the meal that gets our motors running, our brains firing on all cylinders. Your body NEEDS fuel. My fellow working stiffs need me to eat breakfast. Otherwise, by 11 am, hunger has mixed with anger, making me hangry…and things can get ugly. So unless I’m not feeling well, I eat breakfast. I’m trying to lose some weight, tone up, and make some adaptable life changes. Eating healthier. Now, I’m not doing a gluten-free diet. I am trying to cut out white pastas & breads, white rice, “whole wheat” pasta’s & breads that aren’t really all that more nutritious than plain old white bread. I’m working to incorporate more whole grains, more quinoa. I’m lucky in that I don’t HAVE to do GF. That my stomach won’t be in an uproar if I eat a sandwich on wheat bread. But I know so many people out there don’t have a choice but to be GF. And since so many people are having to adopt a gluten-free lifestyle, it makes gluten-free food items more readily available to the general population. A welcome side effect. Now, back to the recipe. I’ve been experimenting with quinoa, using it in place of rice and pasta where I feel it’s a good substitute. But everything I’ve been using it in thus far has been a savory dish. I wanted to try it in a sweeter option, like something for breakfast. I wanted to incorporate fruit, since I know that I’m not eating enough servings of it each day. I wanted the recipe to taste good, be healthy, but not lack flavor. I wanted it to be something I could make a big batch of, and reheat throughout the work week. 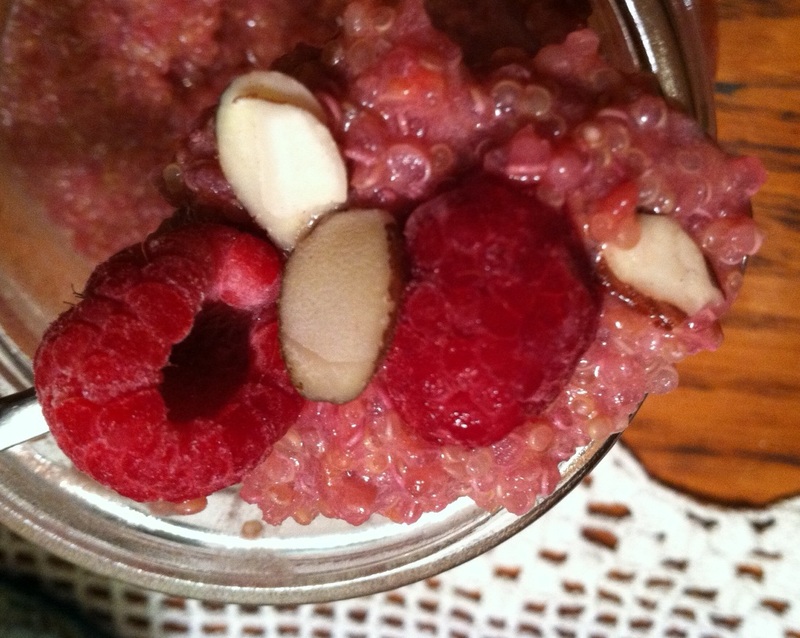 Raspberry Almond Breakfast Quinoa was born. It’s quick and easy to make, has a small list of ingredients, and is a healthy, portable, filling breakfast option! I get 4 packed pint jars worth. If you aren’t into using almond milk, you could totally replace it with your regular milk. I think chocolate almond milk would also be a tasty sub. Raspberries aren’t your thing? Try blueberries or strawberries in the same ratio. Or do a mix! Use fresh if you have them. I’m using berries that I froze over the summer. Based on the ingredients I used, this recipe is around 125 calories per serving, with maybe 2 grams of fat. You can also sprinkle on some cinnamon, or unsweetened cocoa powder for an extra flavor boost! In a medium saucepan, add your almond milk and 1 cup of the raspberries. Cook over medium heat until the raspberries start to soften and break apart. Add your quinoa, letting the mixture come back up to a boil. Simmer on low for 10 minutes. Remove from heat, cover, and set aside for 10 more minutes. Once the mixture has cooled slightly and thickened, sweeten with Stevia to taste. I used about 1 1/2 teaspoons Stevia powder for mine to get it to the taste I wanted. Portion your quinoa mixture into pint mason jars, filling right up to the threaded part of the jars. Top each jar with the other cup of raspberries, sprinkling each jar with slivered almonds. Seal jars and store in fridge. You can reheat this on the stove, in the microwave, or enjoy it at room temp. Either way, it’s good!